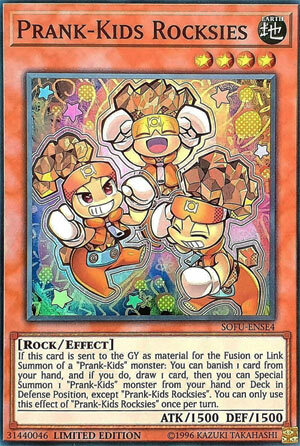 If this card is sent to the GY as material for the Fusion or Link Summon of a “Prank-Kids” monster: You can banish 1 card from your hand, and if you do, draw 1 card, then you can Special Summon 1 “Prank-Kids” monster from your hand or Deck in Defense Position, except “Prank-Kids Rocksies”. You can only use this effect of “Prank-Kids Rocksies” once per turn. Those darn kids! Prank-Kids week on Pojo and we’re starting things off with Prank-Kids Rocksies. The balanced attack/defense of the Prank-Kids, Rocksies has decent stats for a Level 4. Getting a Special Summon from the deck alongside a draw off of a Fusion or Link Summon of a Prank-Kids monster using Rocksies will net you a +1 after you banish from your hand a card. Pluses are always welcome in any strategy and it isn’t like you can’t play stuff alongside Prank-Kids to benefit from the banish effect. Thunder Dragons come to mind, maybe even some D.D monsters. When this cards effect kicks you will continue your plays in the Extra Deck and continue to net advantage off the Link and Fusion Prank-Kids you summon, Rocksies is a combo starter and a great one at that. Prank-Kids Rocksies is a Level 4 Earth Rock-type monster with 1500 Atk and 1500 Def. The stats are fine for a Level 4. I still like cards like Sangan and WotBF for nostalgia and this works for both. Once per turn, after the hits the grave from the Fusion or Link Summon of a Prank-Kids monster, you can banish a card from your hand, then draw a card, then Special Summon a different Prank-Kids monster from your hand or deck. This reads like there is no real cost, so every part of the effect has to happen to successfully plus. Banishing is kinda meh, but drawing is good, and replacing itself with something potentially better is how the game is won. Not bad for a new archetype. Prank-Kids Rocksies have that landstar cuteness too. Happy Monday. With Mayakashi and Nephthys down, we finally get to the Prank-Kids archetype, which might be the hardest week for me to design because I want to use these days to try and give the best understanding of what the deck does, so I’ll use each day to help explain other cards. Starting off the Prank-Kids week is one of the four Main Deck Prank-Kids, Prank-Kids Rocksies. Rocksies is a Level 4 EARTH Rock with 1500 ATK and DEF. Stats are very meh on a Level 4 but I’ve seen worse, EARTH is fine and Rock has some niches, though not on this. If this card is sent to the GY for the Fusion or Link Summon of a Prank-Kids monster, you can banish 1 card from your hand to draw 1 card, then you can Special Summon any Prank-Kids monster from your deck except another Rocksies, and this is a hard once per turn effect of Rocksies. Note you have to do the banish and draw before you can consider summoning a Prank-Kids out of your deck, but that’s fine considering you can use that opportunity to get rid of a card you don’t need in exchange for a potentially better card. All of the Prank-Kids monsters have effects to summon another Prank-Kids monster out of your deck after you do something else and you use said Prank-Kids for a Fusion or Link Summon of a Prank-Kids, and I’d argue that Rocksies is the best one considering Fansies ditches a Prank-Kids card into your GY where there is only one card I can think of you’d really like to send there, Dropsies gives you LP, and Lampsies burns your opponent. All the Prank-Kids monsters are good as three ofs in the Prank-Kids deck because they all thin your deck for more Prank-Kids monsters, but Rocksies has the best effect beyond the summoning with that draw 1, and the banishing can synergize with Thunder Dragons since Prank-Kids do also have a Thunder monster in the main deck, though Rocksies isn’t that much better over the others, cause all that matters the most is the Prank-Kids monsters float into other Prank-Kids. Art: 4/5 Those little rascals. I’m excited for this week. Prank-Kids are very fun, and I’m excited as well to see what we cover this week. (I usually do my reviews for the week all at once, but just one at a time, so as to keep myself surprised). As for some backstory to open, Prank-Kids start small and then turn into Fusion or Link Monsters to be stronger, and everyone does different things. The Main-Deck Kids do a variety of things, but the Extra Deck Kids either recover cards from your Graveyard, Special Summon from your Graveyard, and some offer a one turn protection of sorts. But they don’t all come with a second effect, either. Prank-Kids Rocksies is Level 4, appropriately Rock type, and Earth, with 1500 attack and defense. Not awful, but not on the strong end for Level 4. If Rocksies is sent to the Graveyard as Material for a theme specific Fusion or Link Monster (Get use to hearing that, it’s the theme specific clause that grants various effects) you can remove a card from your Hand to Draw a card. That’s a fair 1-for-1. Additionally, after that, you can Special Summon a Prank-Kids Monster from your Hand or Deck, in defense position, naturally, excluding present company here. This is (surprise) a once per turn effect, but that’s understandable. Prank-Kids are very fast and combo oriented, and can generate you some asinine advantage if you play right. This is a great card, and probably one of the biggest pieces to make this engine work. One further note…removal is a big vulnerability to this Deck. I know that can be said for a lot of Decks, but the self-removal aspect of Prank-Kids is small, and if your cards are removed instead of sent to the Graveyard, you aren’t getting anything, and that can shut you down really fast. Just beware of this fact. Art: 4.5/5 These look cartoony without looking too stupid, they do look mischievous, (and triumphant) don’t they?